They say time flies when you’re having fun ! Since launching our new business Mitchell’s Realty Hervey Bay on the 5th of January 2016 we have proudly listed over 70 properties and placed 41 under contract ! We are now in what is “historically” one of our busiest selling periods of the year which kicks in with “spring” and generally runs up until the second week of December each year. If you are thinking of selling and would like to know where your home would sell in the current market – contact our team on 07 4125 2950 and we will arrange to view your home or investment property & prepared a detailed current market analysis report for you at no cost or obligation. 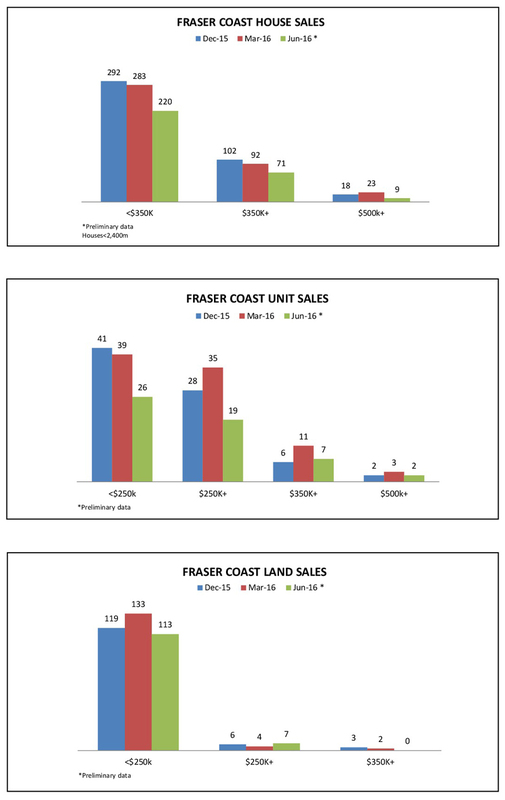 As a “best practice” REIQ member we are able to provide you with this detailed Fraser Coast Market Monitor quarterly report as follows and suggest that there has never been a better time to invest in Hervey Bay. Affordability, sustainable growth, and favourable lifestyle factors, were three key factors driving southern state investors to the Queensland residential property market in the June quarter, according to data released in the REIQ June Queensland Market Monitor. The house market this quarter marginally improved over the March quarter. 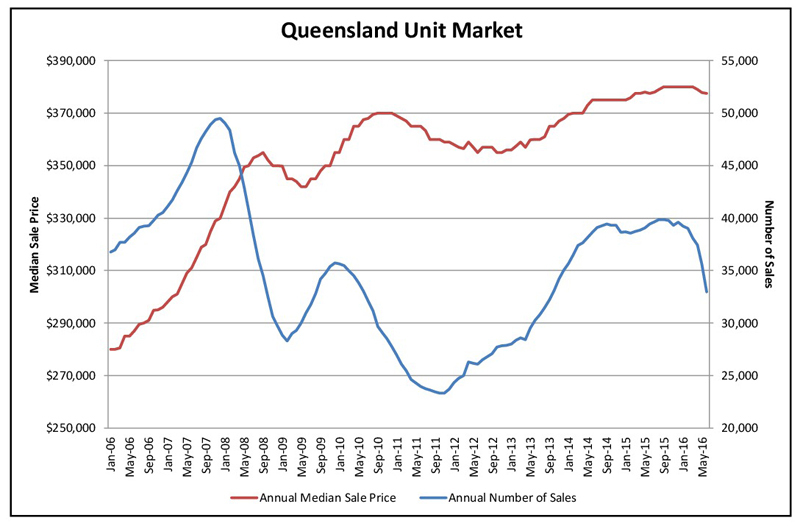 In this edition of the QMM,the REIQ has introduced reporting on the state-wide median prices. 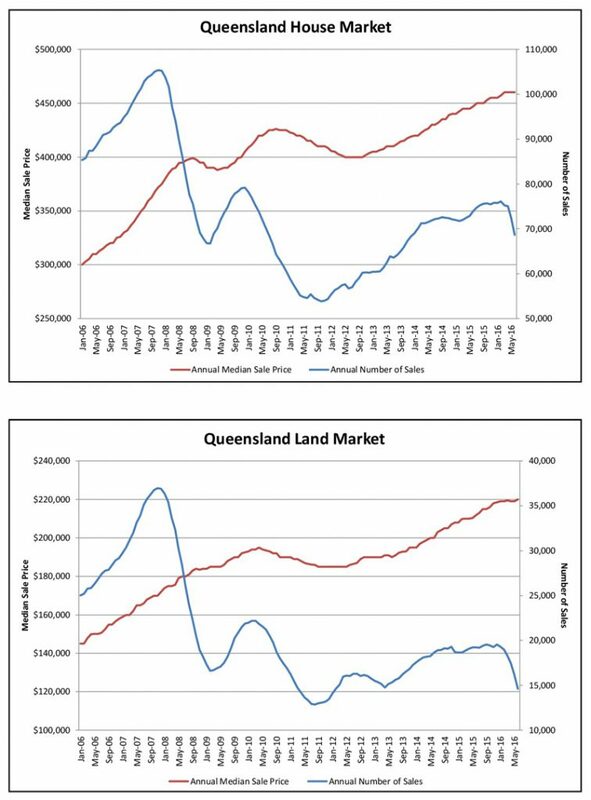 The median house price for Queensland was $455,000,representing a fractional increase of 0.28 per cent over last quarter. The more meaningful data is the annual median sale price, which was $453,00 0 for the June quarter, an increase of 2.95 per cent compared with12 months ago and a solid 10.49 per cent over five years ago. Blackwater, and Emerald will take longer to recover. The good news is that the spot price of coking coal rose to $170/tonne in September, and if this holds, there could be positive news on the horizon for these towns. The coastal centres of Gladstone, Fraser Coast,Rockhampton, Mackay and Bundaberg are still below where they were five years ago. Some suburbs of Mackay, including Blacks Beach, North Mackay and South Mackay, are around 30 per cent below their fiveyear waterline.However, regional areas such as the Gold Coast, the Sunshine Coast, Toowoomba and Cairns, have performed well and the Brisbane and surrounding areas have also performed very strongly, to pull the state through the recent difficulties. The unit market in Brisbane City (CBD) has continued to face the question of oversupply, and so far the data does not support that verdict. The median unit price in inner Brisbane grew 4.2 per cent in the June quarter, to $500,000. The annual median unit price of $488,000 is 1.5 per cent lower than 12 months ago, when it was $495,000 but the current levels are still above five years ago, by 3.5 per cent. The Bundaberg market experienced a surge of 16 per cent, however, with a fall last quarter of 8.9 per cent it’s clear this market is still very volatile. 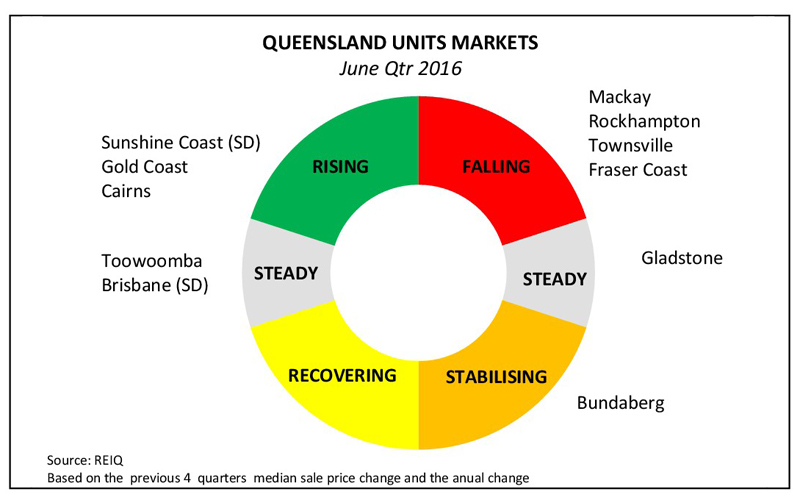 Removing the outlier of Bundaberg, the strongest market was Cairns, which grew 3.9 per cent.The biggest June quarter fall in median unit prices was the Sunshine Coast, which contracted 5.0 per cent. The Gold Coast grew 1.6 per cent and Brisbane held steady with zero growth, zero fall. However, elsewhere in the state the unit market has stalled. 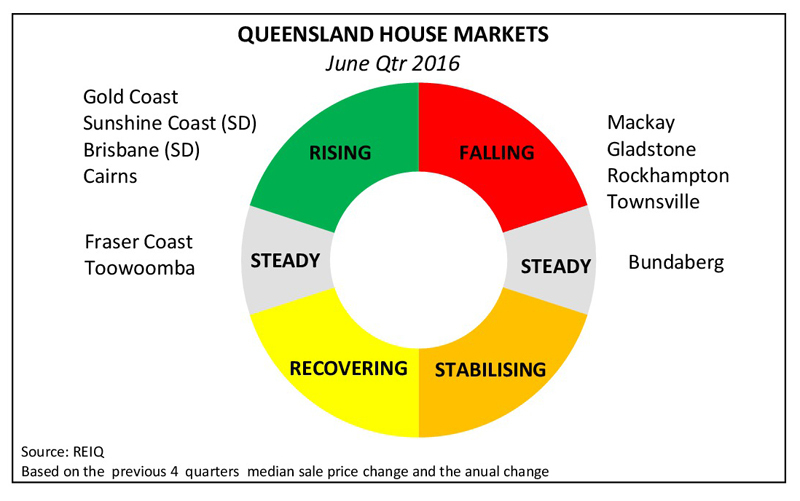 In Gladstone and Rockhampton there were not enough sales in either market to report on any meaningful trends. All other markets contracted. Property demand is driven by owner-occupiers and first-home buyers. The State Government announced an increase of the Great Start Grant from $15,000 to $20,000 and the Building Better Regional Cities Grant of $12,000 has been extended until May 2017. Despite the increase in available grants for first-home buyers, demand remains subdued. The rental market also contracted with vacancy rates escalating from 3.2 per cent in March to 4.1 per cent in June, sitting now within the weak range. The State Government budget has committed about $28 million to upgrade the interchange in southern Maryborough, due for completion in May 2017. While this is probably the largest infrastructure project in the area, the residential property market does not seem to get any major incentive from local infrastructure investment. The prognosis for the residential property market in Fraser Coast is weak with no major infrastructure projects in the pipeline and market trend indicators showing a fall in demand. For a third consecutive quarter, the median sale price slipped or remained steady. The median sale price for the June quarter dropped to $290,000 and the annual median sale price remained relatively steady at about $302,000. Over the medium term, the median sale price increased at a very slow pace of 2.6 per cent (below annual inflation), evidencing the challenges experienced in the Fraser Coast residential property market.The annual volume of sales showed a slight increase from 1524 transactions in June 2015 to 1553 transactions in June 2016. The preliminary quarter volume of sales reported a contraction with the largest volume of sales remaining below $350,000. The market trend indicators are showing a reduction in demand with the median days on market increasing from 78 days in May 2015 to 87 days in May 2016. Similarly, the median vendor discount increased from 6.2 per cent to 6.7 per cent over the 12 months to May 2016. Compared to the house market, the unit market has definitely experienced the largest demand challenge. The unit median sale price contracted over the June quarter by 4.9 per cent from $262,750 to $250,000. The annual contraction was 5.3 per cent and the five-year contraction was 10.5 per cent. Sales activity remained relatively stable over the 12 months period to June, reporting a small increase of 18 transactions over the past year. The largest volume of activity remains in the price range below $250,000. Market trend indicators demonstrate a slip in demand with median days on market increasing from 80 days in May 2015 to 91 days in May 2016. The median vendor discount jumped from 5 per cent in May 2015 to 6.4 per cent in May 2016. 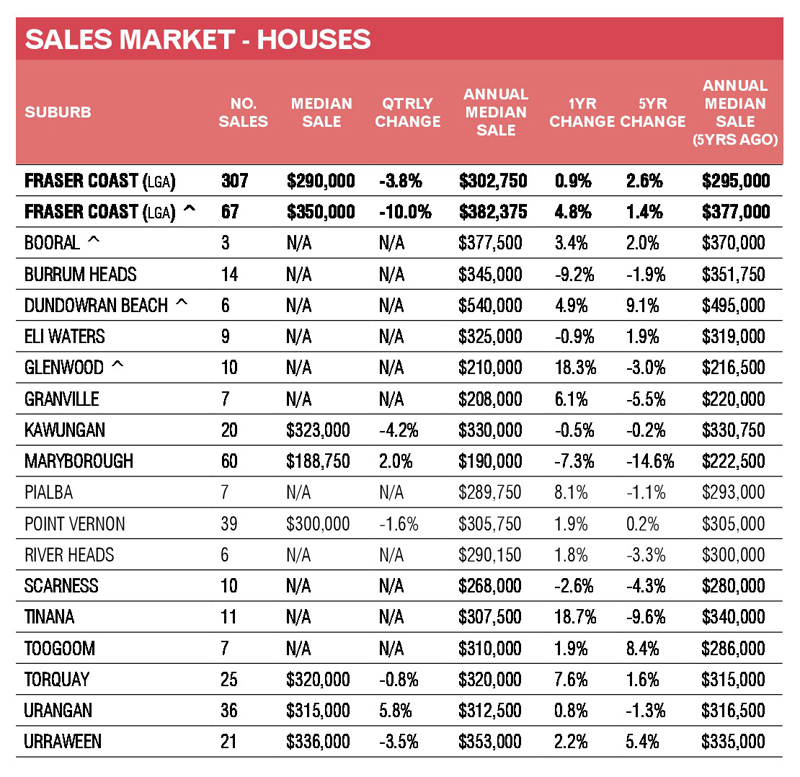 Vacancy rates in the Fraser Coast increased to 4.1 per cent over the June quarter and are now sitting within the weak range. Maryborough vacancy rate remained at around 3 per cent. However, Hervey Bay vacancy rates increased from 3.1 per cent in March to 4.4 per cent in June. The median weekly rent for a three-bedroom house and a two-bedroom unit increased by $5 and $10 in the June 2016 quarter, reaching $290 and $245 per week, respectively. Three-bedroom townhouse median weekly rents remained steady at $320 per week.